Delaware City Council is considering legislation that would create parcel TIF funds for four parcels consisting of the former Buehler’s site and the three outlots fronting the property on West Central Avenue. 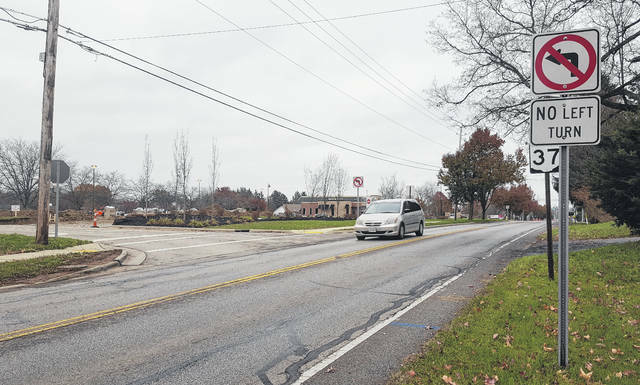 The funds collected through the parcel TIF would be used to help with future infrastructure improvements in front of the four parcels, including an eastbound left turn lane from West Central Avenue into the properties. Pictured is one of the current entrances from West Central Avenue in which left-hand turns are prohibited. With future infrastructure improvements on the radar for West Central Avenue between Crestview and Buehler drives, the City of Delaware is considering any and all funding sources to help bear the costs. On Monday, City Council heard the first reading of an ordinance addressing one of the available options — allowing four parcels (former Buehler’s Fresh Foods site and the three outlots in front of the building) within the area in question to be exempt from taxation through a Tax Increment Financing (TIF) agreement in which service payments would be made by the property owners in lieu of property taxes. Hughes added the TIF fund would generate approximately $140,000 off of the four parcels over a 30-year period, and the city is also requesting $50,000 contributions from the developers of the two parcels yet to be developed commercially. One of the two parcels without commercial buildings (the middle outlot) is currently under development by Jackson Real Estate & Development, and according to a city fact sheet, the firm has already made its $50,000 contribution. As for the impact of the proposed parcel TIF on Delaware City Schools and the Delaware Area Career Center, both schools would continue to receive its share of taxes since the measure calls for a non-school TIF to be instituted, Hughes said. No exact date for the proposed infrastructure improvements, which would include an eastbound left turn lane from West Central Avenue into the four-parcel site, has been established. With land development activity in the city reaching record levels, council approved an ordinance supplementing the 2017 appropriations ordinance by transferring $350,000 from the unencumbered balance of the general fund to land development-engineering professional services to allow the city to continue project plan reviews and construction inspections through the end of the year. Public Works Director/City Engineer Bill Ferrigno told council the favorable weather over the past several months resulted in increased construction activities, which led to the request for additional funds above the $900,000 already approved for 2017. He added the total expenses for project plan reviews and construction inspections are expected to be around $1.6 million for 2017 with revenues estimated to be between $1.5 and $1.7 million, so the city will be recapturing its costs.